We specialize in the production of custom-molded keypads, membrane keypads, rubber keypads, and silicone rubber keypads. If backlighting is required, we provide various backlighting styles ranging from LED (Light-Emitting Diode) to incandescent and LGF (Light Guide Film), a new technology that produces a bright, evenly illuminated custom keypad that possesses a good tactile feel. Custom-molded keypads can be assembled using a variety of materials, including epoxy, acrylic, polycarbonate, silicone and more. We also co-mold silicone with metal frames for a rubber keypad that is both rigid and pliable then ease the assembly into the final product. Our innovative custom-molded keypads can be manufactured to accommodate a variety of products including audio/video equipment, calculators, MRI machines, medical equipment, and LCD watches. Offering a range of styles such as dome, rubber, silicone, hard caps, and sheet metal, we have served a wide array of industries including aerospace, appliances and electronics. Contact Elite Technology today for more information about our premium custom-molded keypads, membrane keypads, and silicone rubber keypads. Created with silicone molding material, this keypad features an opaque material and positive image printing. The ink used to print the keypad's graphics is a silicone-based ink that bonds to the silicone base material after post curing. Carbon pills on the bottom of each key allows the buttons to interact with a PCB in the final assembly. 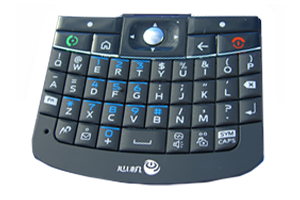 This keypad is molded with translucent silicone material, screened with the required graphic colors, then spray-painted with a silicone-based black ink. Laser etching is then performed to allow the colors to show when the keypad is backlit. Final process is coating the keypad to extend the life of the graphics. As the name suggests this keypad has Polycarbonate tops permanently adhered to a silicone base material. The graphics, in this case, are clear except for the green send and red end keys. When back lit these clear graphics appear white. However, when the backlighting is not on, the graphics appear black. This particular version called for a very attractive blue plastic key top. This keypad has the soft feel of TPU (Thermoplastic Polyurethane). This TPU film is formed using a co-molding process with silicone rubber. It is similar to IMD (In Mold Decorating) but has a softer feel than is available with PET films generally used in IMD keypads. TPU film cannot be formed with deep draws like PET films used in IMD keypads. Thus they are ideal for thin keypads used in small hand held products. The TPU material has superior abrasion resistance and is resistant to chemicals and UV lighting. Length & Width of Individual key Min. • Initial Graphics Exchange Specification, ANSI file format.